McGraw-Hill Education, 2017., 2nd. 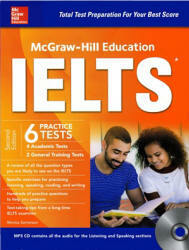 — 468 p.
McGraw-Hill Education IELTS, Second Edition is the ideal way to sharpen skills and prepare for this high-stakes English proficiency test, which is required for admission or hiring by schools, multinational corporations, and government agencies worldwide. Whether you’re preparing for the Academic or General Training version of the IELTS, you’ll benefit from the intensive practice you get from tests prepared by a veteran IELTS teacher and grader. The International English Language Testing System (IELTS) is the world's largest exam, and as its name suggests, it is used to test English language for college and university entrance, as well as for immigration or registration with professional bodies. There are two kinds of IELTS tests: the Academic test for further study and the General Training (GT) test for immigration. There is no pass or fail with IELTS. Instead, there are bands that show a person's level. These bands range from 0-9. A Zero is a candidate who didn't come for the test; and a Nine is a native speaker - someone whose English is perfect. A Five is a person who makes a lot of mistakes but can generally be understood. A Six is still an intermediate speaker, whereas a Seven is starting to get good. An Eight has perhaps only five or six errors in his or her 650 words of writing, and in the Speaking test, makes only very occasional errors. A Six is not that hard to score, but a Seven takes years of intensive study and usually residence in an English-speaking country. The bands are used by different institutions or authorities. If you want to attend university in many English-speaking countries, you need at least IELTS 5.5 - the more famous the university, or the course, the higher the score you need. If you want permanent residence in Canada, you need a Seven. If you're a nurse and you want to continue nursing in Australia, then you also need a Seven overall, including a Seven in Speaking. IELTS has full and half bands, meaning that a person who gets 6.5 is better than a Six, but not yet a Seven. One thing to note about these scores is that it's rather easy to go from a Four to a 4.5, or even a Five to a 5.5, but to progress beyond Six takes much longer. There are also candidates who never reach Six. You can't just take the test, take it again, and again and again, and hope on the fifth attempt you'll be handed a 6.5. No. You've got to fit the description of 6.5 in order to get it. If you'd like to know which nationalities or first languages currently achieve which scores, go to the IELTS website: www.ielts.org. There's plenty of interesting data there as well as free practice materials.